The latest release includes features that improve the user experience, and introduces the new field data collection capabilities and provides enhanced support for Esri ArcGIS v.10.1 and v.10.2. You can share this information with someone who has no TerraGo or Esri software. Google Earth users using KML files can export GeoMarks as KML. TerraGo is now using ArcMap with TerraGo Publisher software, which is a collection of capabilities that allow you to leverage GeoPDFs to make it easy to use resources that you might not find available otherwise. 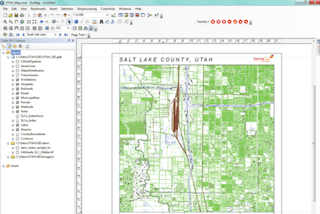 With TerraGo Publisher, you can use a blank map template to bring in GeoPDF as a backdrop. You can dig into the PDF and display the content you want. With different GeoPDFs you can initialize ArcGIS to share information. A lot of information is scale dependent that you can preserve in a GeoPDF. You can also leave out different layers if you want to, resulting in a smaller performing file. This entry was posted on Tuesday, February 4th, 2014 at 11:13 am. You can follow any responses to this entry through the RSS 2.0 feed. You can leave a response, or trackback from your own site.